ETOBICOKE, Ont. – She says it’s like a doctor explaining a medical procedure to his patient. You get individuals who are nervous and ill at ease before you, but when it’s finished, they are always okay. Christine Horodnyk, TFX International president, likens the function of her company to the meticulous perfectionism of a doctor on call. The TFX International staff knows this feeling all too well. TFX is a specialized vehicle transporter, which has hauled many 3,000 lb ‘babies.’ Everything from antique steam buggies that belong in a museum to the newest Porsches on the market. 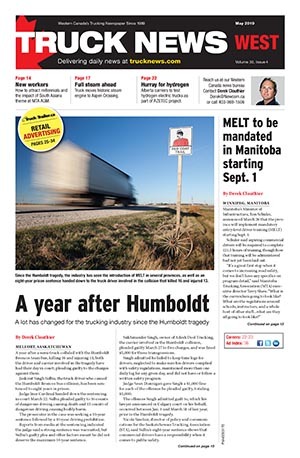 The Etobicoke-based company’s door-to-door service and precision of maneuvering the vehicles has enabled TFX to carve niche markets within the Canadian trucking industry. TFX was there to haul the race cars in Sylvester Stallone’s box office hit, Driven. They were there to move the classic ’67 Plymouth GTX that Chris Farley and David Spade drove in Tommy Boy, and they’ve been a fixture on many other movie sets. Actor Jim Carey asked TFX to surprise his brother in California with the 1965 baby blue Thunderbird for his 30th birthday. Another niche, explains vice-president, Jacqui Macnally, is for sports icons – Alexander Mogilny, Donovan Bailey, Charles Oakley, Teemu Selanne, among other athletic car fanatics – they’ve moved them all, she says. TFX also has a presence with manufacturers where they will haul prototypes, sometimes secretively, and deliver them to auto shows or galas across North America. To make these moves successful, accuracy and confidence is necessary. TFX International uses unique equipment to lug these cars from home to home or show to show. Fully hydraulic trailers are built specifically to handle any surprise vehicle they may receive from day to day. To accompany the equipment, Macnally says, they have a keen fleet of drivers, dispatchers and maintenance mechanics to make it work. Currently TFX staffs 27 people, and the boss feels it is one happy family. 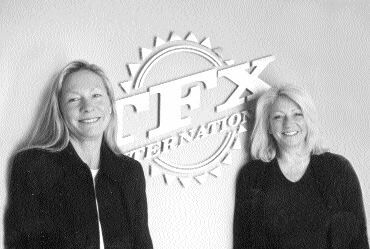 TFX began in 1988 as a division of a freight business that Wally Horodnyk, TFX vice-president and Christine’s husband, had started, and in 1998 the automobile hauling business broke away and set out on its own. Today, Macnally says the feedback and the reception from the industry has been astounding. Macnally explains that a key part of the customer relationship is presentation. TFX drivers and the equipment they use are constantly being trained and maintained. “The drivers do a lot of PR work on the road, so we need people who can relate well to others. 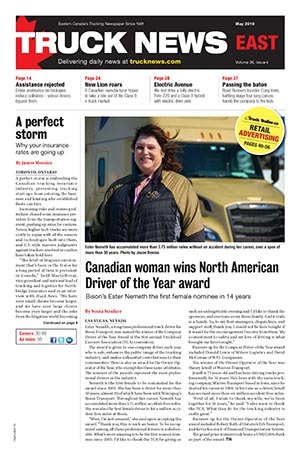 They deal with the clients directly and they are our front line, and they have to make the customer feel comfortable and calm when they take their vehicles from them – that makes a big difference for us here at the office,” says Christine Horodnyk. Also the presentation of their trailers is very important to the team at TFX. Their attempt at modern but elegant was successful with their logo emerging from a series of tears done in royalty colors. Wally Horodnyk, says it is a car show every day in the TFX warehouse, and it is the only job he has ever wanted. “I’m happy because I get to do everything I ever wanted to do – play with cars, be a salesman, be a mechanic – everything I have trained to do I can do right here,” he says. As for Christine and Jacqui, running a company in a male dominated industry has proven to be interesting. “Many are often skeptical of us until we start talking to them and that barrier subsides. I’m surprised that that attitude is still there because there are a lot of women who hold high positions in the trucking industry. However, I think men are starting to get accustomed to women becoming industry decision makers,” says Macnally. Christine says you have to be able to laugh about it. So, no matter if it’s an old Rolls Royce with brass dials and buttons, a new Ferrari, a customized Harley, or a Mini, TFX is prepared to go the extra mile to ensure that your ‘baby’ gets back in your hands safely.